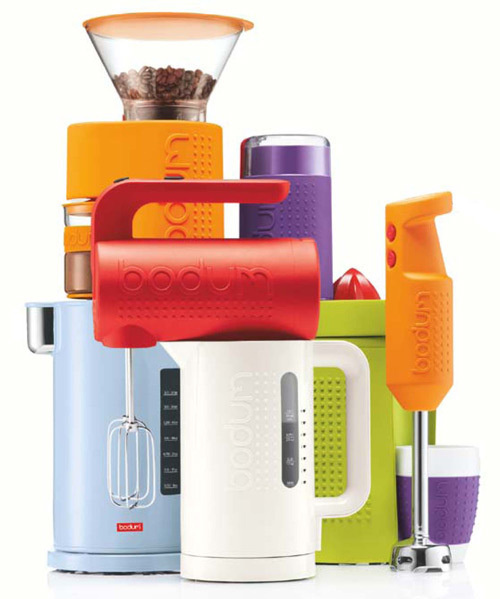 Danish kitchenware maker Bodum may be best known for their simple coffee makers. Their clean design, perfect functionality, and ability to make an amazing cup of coffee on the cheap has made the name Bodum synonymous with the French Press. But they actually have a much broader spectrum of products than the classic glass plunger-carafe, and their new rugged-ish Bistro line looks fantastic. Catering to Scandinavians and those who wish their kitchens were Scandinavian, the Bistro line is bright, bold, simple, and functional. It’s ballsy as well; covered in rubber with little grippy rubber numbs in odd places, the line is unmistakably modern. That means it won’t fit in every kitchen, but I’m tempted to redesign my kitchen to better mesh with this stuff. The line includes a burr grinder ($100), blade grinder ($30), juicer ($100), immersion blender ($50), two sizes of electric kettles ($50 and $70), toaster ($80), and a hand mixer ($60). My favorites are the immersion blender and burr grinder. The immersion blender (as well as the hand mixer, but I’m being selfish here: I make soups all the time, and I never bake) is a perfect fit for the rubbery grippy design, since this kind of blender often flies around unpredictably and you need a tight hold on it at all times. The burr grinder doesn’t really need to be bright orange and rubbery, but it’s gorgeous and a great fit for Bodum’s French Presses–and $100 is a surprisingly low price for a burr grinder, provided it does a decent job. The entire line will be available this Fall, and you’ll be able to find them at pretty much any kitchenware, houseware, department, or Scandinavian store.